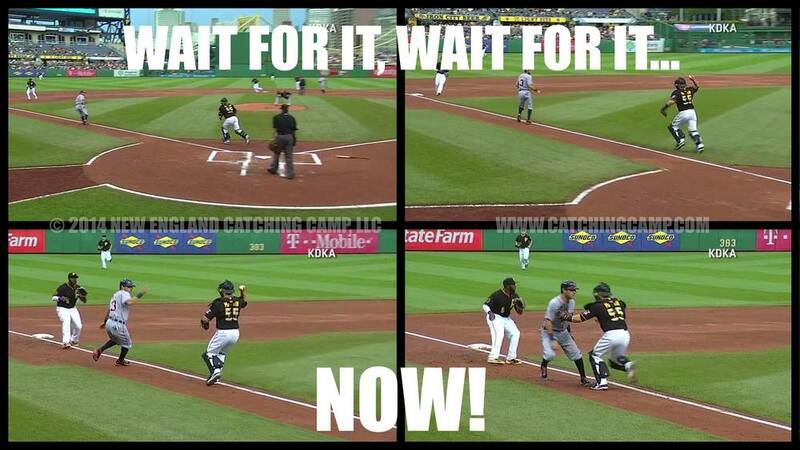 During yesterday's game against the Tigers, Pirates' catcher Russell Martin demonstrated the perfect approach to a run down between 3B and home plate. Tigers' DH Victor Martinez hit a sharp comebacker to Pirates' pitcher Edison Volquez, who made an incredible behind the back snag. He immediately fired to home once he saw that Tigers' 2B Ian Kinsler had taken off for the plate. Martin played it perfectly, running Kinsler back up the line, making a few gentle pump-fakes with the ball to get Kinsler to stop in his tracks and head back towards 3B. The best part of this play in my opinion was how far he pushed up the line to make sure that Kinsler was constantly moving towards 3B. Instead of his last pump-fake, Martin could have made the throw to 3B and they would have likely recorded the out anyway, but Martin saw Kinsler put on the breaks and direct his momentum towards home plate. So, instead of forcing the play back in the direction of the plate, Martin held onto the ball and proceeded to make the tag himself. If Kinsler was going to be safe, it wasn't going to be at home. That is what Martin guaranteed with his heads-up play. I see so many catchers anxious to get rid of the ball and they immediately throw to 3B once they see the runner break back to the bag. The problem is that it will almost always take longer for the ball to get to 3B than it will for the runner to change direction and head for home. We always want the play moving away from home plate. That way, if the runner does evade a tag, they aren't adding a run to the board in the process. Catchers, push the play towards 3B and away from home plate. If the runner makes it back, at least they didn't score and you've given your team a chance to get out of the inning unscathed.